The online provider of casino content Red Rake Gaming, renowned for its innovation in the development of video slot machines and video bingos, has just launched a new release in which, one again more striking graphics, spectacular animations and mathematics that ensure a great playing experience comprise a slot machine that will provide great moments of fun to all its players. 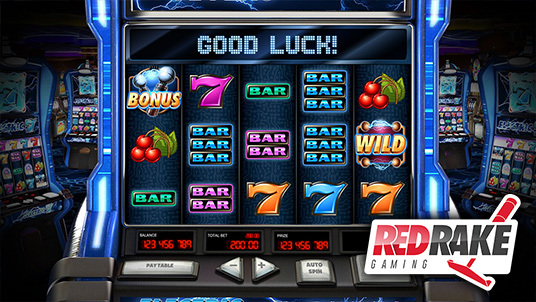 This new video slot machine with 3x5 reels and 30 prize lines captures the attention of players from the first moment on through exciting electrical discharges on each spin. This is a video slot machine with such spectacular prizes as “Gigantic Sevens Symbols”, “Free Spins Phase” that start up a new upper reel and “Electric Sevens” that turn the other sevens into their colour in order to transform them into Wilds and thus allow the player to obtain even more prizes. Innovation, improvement and careful detail can be seen again in this new slot machine from Red Rake Gaming.